To meet Nebraska’s legal obligation to increase the flow of the Republican River into Kansas, the Central Nebraska Public Power and Irrigation District has proposed creating a connection in Nebraska between the Platte River Basin and the Republican River Basin. After entering north central Kansas, the Republican River feeds into Lovewell Reservoir and Milford Reservoir before joining the Kansas River near Junction City. The Republican River also connects with several other waterways in north central Kansas. The State of Kansas opposes this project because invasive Asian Carp and White Perch in the Platte River could enter the Republican River (along with other nuisance species) if the two rivers are connected. As a result, the project could severely impact Kansas’ sport fish and native aquatic species, water-based recreation, tourism and the state’s fishing economy. There is no evidence that those two species currently live in the Republican River. Asian Carp can grow to more than 40 inches long and weigh more than 50 pounds. One Asian Carp species, the Silver Carp, is known to leap up to 10 feet in the air when boats or personal watercraft pass over. They pose a risk of serious injury to boaters and skiers who may find themselves surrounded by dozens of large, heavy fish leaping wildly from the water. Asian Carp and White Perch also compete with sport fish, so Kansas’ $210,000,000 recreational fishing industry would be at risk from declines of sport fish such as bass, crappie and walleye. Asian Carp are filter-feeders that compete with other fish for food and space. They are prolific breeders, grow fast and can quickly become the predominate fish species in a lake or river. 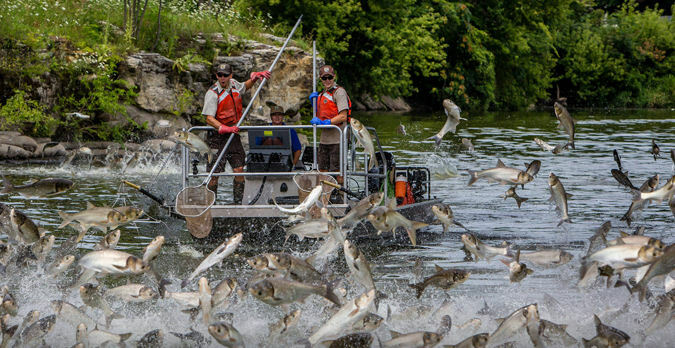 In other states, some lakes with Asian Carp have experienced sport fish population declines of more than 80 percent with corresponding damage to their fishing and tourism economies.